When you find yourself craving pizza in Rome there’s only one place to go. Naples. It was Friday and although it was 14.36 the train was shockingly busy. If you had arrived early you would have got a seat, but we only just made the train because we’d only just made the bus. Because we’d only just booked a hotel. Because we’d only just decided to go. We’d walked along the platform but every carriage was full. The winners who’d managed to get on were closing the doors and not letting any more people on. The door to the last carriage was open and looked to have a little space inside. We followed a man into the sweaty Lino floored entrance. It was immediately clear why there was still room. 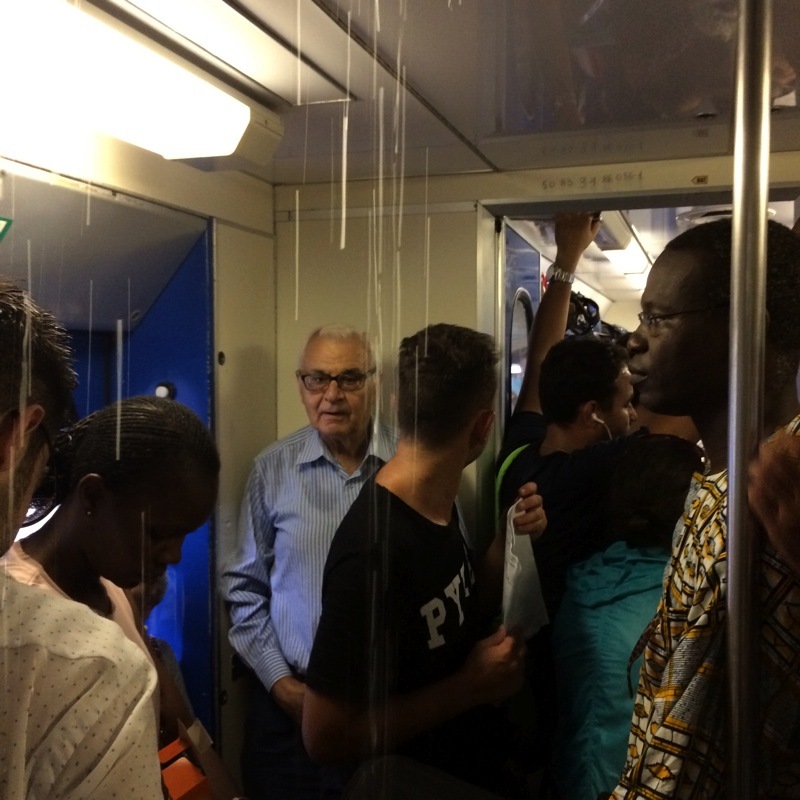 Water was pouring through a grill on the train’s ceiling. So much for sleeping on the train. Instead I was standing in a growing puddle trying to avoid getting soaked. Every time someone wanted to get off was like playing Tetris with humans, suitcases and the internal carriage doors. Although we could eventually sit down I arrived in Naples with sodden feet. That though was a minor point. We had arrived in the pizza capital of the world and were keen to try the local delicacies as often as possible. And as soon as possible. We crossed the large Piazza Garibaldi in front of the station and walked up Via Pasquale Stanislao Mancini. 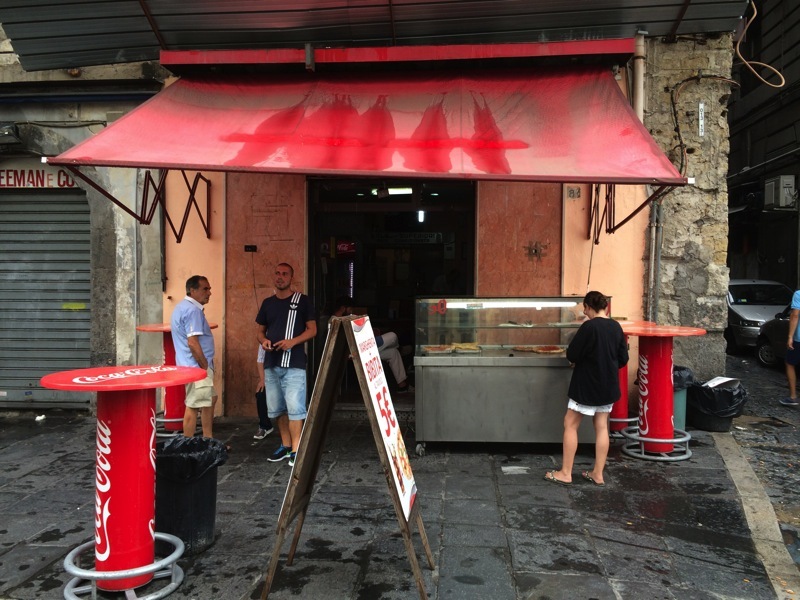 This takes you straight into the dirty, slightly daunting Naples where rubbish is on the streets, the buildings need repair and the shopkeepers sit outside their small shops chatting. In Naples pizza is a street food and this was our first opportunity to try it. The surroundings don’t scream michelin star, but years ago I’d had an excellent pizza here. Would the quality be the same? The trouble with street pizza is that the quality depends on how soon you get it after cooking. Our timing was off and rather than being handed the pizza we’d ordered we watched in surprise as it was taken back into the restaurant to be reinserted in the oven. 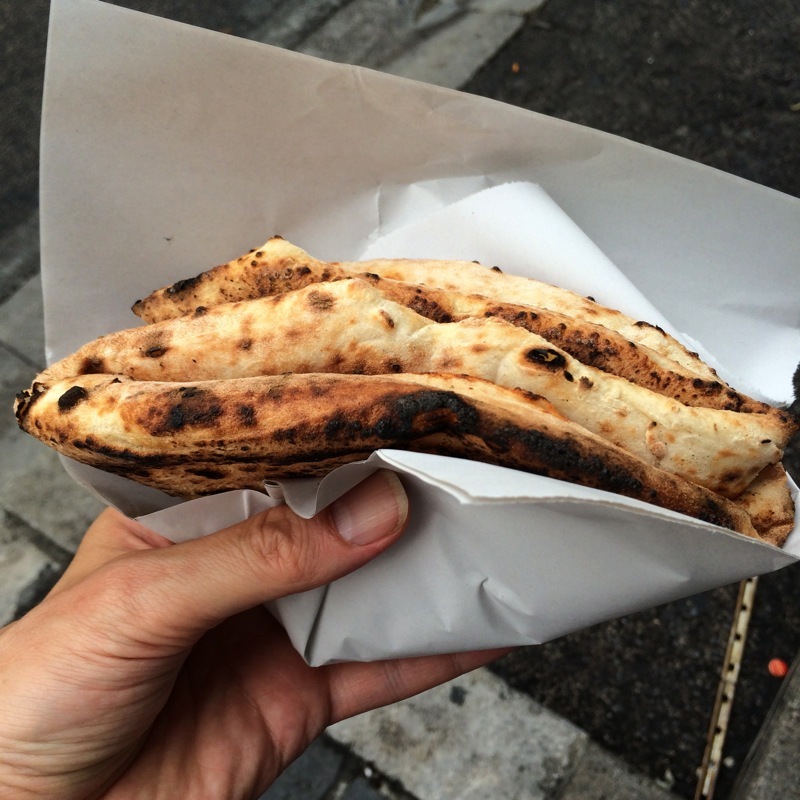 Nevertheless, served folded into quarters it was an authentic sight, a well-charred base made with soft flexible dough. Too salty, there was not much mozzarella and the outer crusts were too dense and chewy. The insides were thinner and creamier, with a very full-flavoured tomato sauce. Nevertheless it was a proper Neapolitan welcome, served in the local folded style. And it only cost €1.50. For the whole thing.